The College Level Examination Program (CLEP) American Government exam takes a comprehensive look at the political system in the United States. The topics are comparable to an introductory single-semester government or political science course. Questions cover general democratic concepts, definitions of political terms and specific clauses from fundamental documents like the Constitution. The material relates to current issues and historic events beginning with the founding fathers and continuing through the present day. This college course equivalency test gives students a chance to save time and money by earning three college credit hours in 90 minutes. What’s the American Government CLEP Like? The American Government CLEP exam requires a combination of broad and in-depth knowledge. Approximately one-third of the questions relate to the policymaking process and structure of the government. Democratic principles, civil rights, the federal court system and the role of political parties and special interest groups are also covered. Students must also interpret data and analyze the behaviors of politicians and constituents in modern and historical contexts. For this CLEP exam, students have 90 minutes to answer approximately 100 questions. This includes several unscored classification questions and pretest examples. The following list is taken from the American Government CLEP overview from College Board. According to the College Board, reviewing a college-level textbook that focuses on American government, democracy or politics is a great way to prepare for this exam. Assess your knowledge of the topics covered on the course syllabus. Studying the Constitution, learning about the federal court system and keeping up with current events will also help. Set aside time each day to read course materials and to take practice tests. A strong study plan will increase your chances of earning a passing score and college credits that can be transferred to a wide range of educational institutions. 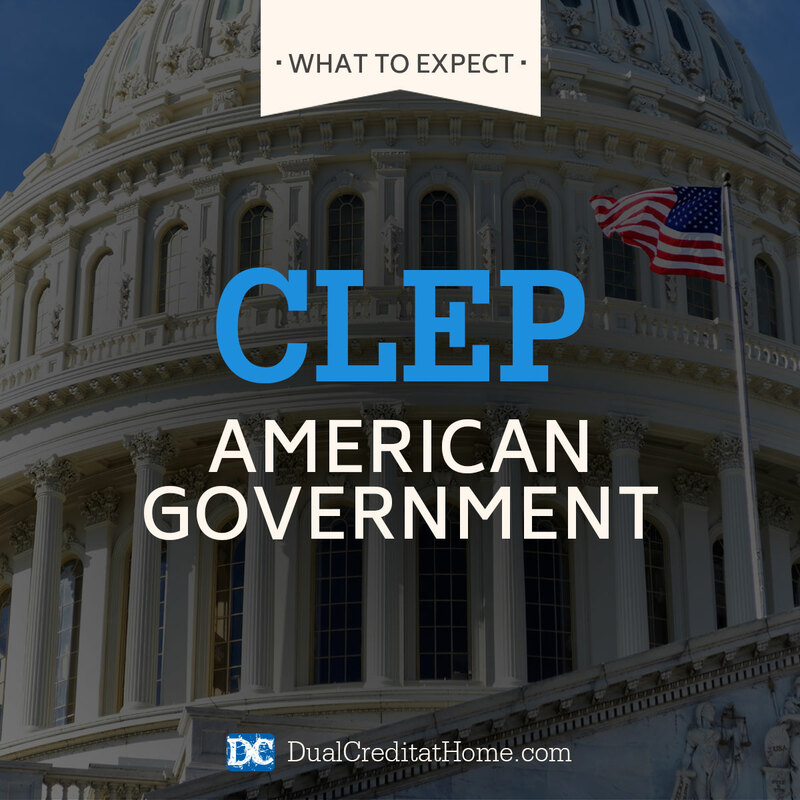 Dual Credit at Home offers a comprehensive American Government CLEP Study Plan. We’ve eliminated all the guesswork of what to study and how to study, so you can successfully pass this exam! Scheduling: You can follow this guide to register for the American Government exam on the CLEP website. Need some guidance on how to register for a CLEP exam? This guide is for you. Costs: The cost of the American Government CLEP exam is $87. Your local testing center might also charge you a fee, typically $25. If you are in the military, testing is free. ACE recommended scores: The raw exam scores are converted into scaled numerical scores between 20 and 80. Students receive their score immediately after taking the exam. Many colleges, including the one we recommend Charter Oak State College, require a passing score of 50, but always confirm that in advance. Semester Hours: Many colleges will award you 3 lower-level college credit hours, but always check with your preferred college for information about credit hours. Dual Credit at Home will give you a complete Study Plan package for taking not just the American Government CLEP exam, but 12 more CLEP & DSST exams that can earn you up to 51 college credits.